New construction image added to "Common Ash". PLEASE NOTE MY DIARY FOR 2019 EXHIBITIONS IS NOW FULL, NO FURTHER ACCEPTED. NOTE ALSO THAT I DO NOT INVITE LAYOUT COMMISSIONS, ALTHOUGH I DO OCCASIONALLY SELL LAYOUTS ON EBAY ONCE I AM TIRED OF THEM ! LAYOUTS SOLD ARE LISTED BELOW. Exhibition Managers who wish to book a layout, please either use the contact page at the end of the site or email dmitch01@freeuk.com. Currently I have a choice of nine exhibition layouts in N , 009, HO, and 00 gauges. The Web pages of a "Layoutaholic" ! Having found an interest in model railways on retirement, I concluded that the space constraints of modern houses were not conducive to large model railways unless one could afford a loft conversion. I couldn't. Looking at several options within the model press & on the Net, I decided that rather than a single permanent layout, variety could be achieved and potential construction boredom alleviated, with small self contained examples. These are generally referred to as "Micro Layouts" or "Field of View Layouts". Such layouts provide the advantage of portability, a boon when invited to exhibitions, and variety given that a different approach / theme may be levied with each new build. Originally concentrating on N Gauge (2mm) thereby ensuring that a lot could be modelled in a relatively small footprint when compared with OO gauge equivalents, the latter invariably requiring at least 150% more footprint. Irrespective of scale modelled, my layouts are usually five square feet or less allowing easy transportation by car. A confirmed micro layout addict, these pages detail the construction of my layouts. At least fifteen layouts have so far been exhibited whilst four have been published; details on their respective pages. My first OO Gauge layout had its initial public airing in 2014 & this was followed in 2015 by a second build. A third & fourth were both completed in 2016. Layouts in both Z & O gauges have also been built but both gauges have left me uninspired, although a fresh & more successful attempt at Z was completed in 2016; sold in 2018. I frequently sell off layouts (seventeen or more to date) once storage space has been exceeded & I need to make room for a new build. "Kidmore Magna", a small field of view layout at just 30" x 24" designed around the track found inside a train set gift box. 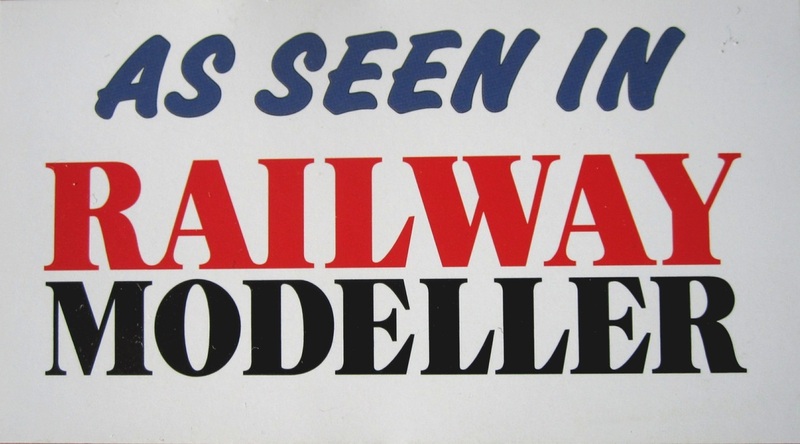 Published in the December 2012 edition of "Railway Modeller" magazine. "Kidmore Cutting": Completed October specifically based on exhibition operating experiences. A "Field of View" size layout at just 36" x 24", two tiered. "Kidmore Short Line" , N scale urban American DCC layout using Kato Unitrack & electrics. Published in April 2017 edition of "Continental Modeller". "Kidmore Coalhouse" : an OO gauge DCC layout featuring a coal loading depot. Original concept scrapped & layout re-built. "Kydmoor Light Railway" : an 009 gauge layout using scratch built locos. "Dark End": an 00 gauge DCC layout showing the really dark sidings behind terraced housing in British Rail days. "The Kidmore Fork": an HO scale North American DCC inglenook layout measuring 48" x 8". Originally built for personal home use, now scrapped & reborn as "The Kidmore Fork v2" & extended to 50" x !2". Now available for exhibitions. "South Yard" : another N gauge North American. "Kidmore Boxed & Extension" : a micro layout created in two wrapping paper boxes. "Puddle Dock": a micro designed as generic to permit running of both UK and USA stock. "Kidmore Lane - Brampton Branch" : an OO gauge DCC layout featuring an East Midlands industrial site. "Kydmoor Bottom" : a tiny 009 end to end. "Quarry End": a combined 009 and 00 gauge layout featuring the interchange sidings of a quarry. "Kidmore TMD": N gauge diesel traction maintenance depot. "Kidmore Creek": N Gauge North America in the Fall. "The Bridge": 00 gauge diesel refuelling site. "KZ": a tiny Z gauge tail chaser. "Kidmore Abbass" : 009 gauge. "Kidmorton" : N Gauge, fully automated. "Kidmore End", N Gauge. Layout based on an old Railway Modeller track plan. "Kidmore Yard", layout published in the N Gauge Society Journal. Kidmore Gumstump" , Layout published in the N Gauge Society Journal. Unless attributed otherwise, all photographic images contained within this Website copyright David J Mitchell, LRPS. Taken on "Kidmore Creek" on a sunny Fall day.